I enjoyed the stories in the Batman: Battle for the Cowl Companion, but indeed that's just what they are -- stories. The five specials collected here range from closely or tertiarily connected to Batman: Battle for the Cowl, all the way to advertisements for other comics entirely; there's not a bad one in the bunch, but you hardly need this companion to understand Battle for the Cowl. Both the "Commissioner Gordon" and "Underground" chapters intersect directly with Battle for the Cowl. In Battle, Gordon mentions his "run-in" with Mr. Freeze, and indeed this is that run-in. Chris Yost's "Underground" -- apparently what we call Batman's villains these days -- answers my earlier question as to what became of Catwoman during Battle for the Cowl; I'm not sure the timeline of the two stories quite fits, but Catwoman running in to Black Mask (whom she believes she murdered) and the post-Countdown to Final Crisis reunion of Harley Quinn and sometime-Catwoman Holly Robison are both great moments. Unexpectedly, my favorite of the stories was "Arkham Asylum." The story is an unabashed lead-in to writer David Hine's forthcoming Arkham Reborn miniseries, but it also takes on the concept of insanity, inprisonment, and the meaning of asylum with striking seriousness. Through the narration of Jermiah Arkham, Hine introduces three fasinating inmates -- one obsessed with his own looks, one so ugly her face drives men insane, and with no face other than what he himself draws -- and the detailed description of Arkham's treatment of the inmates is equally interesting. The cliffhanger ending comes seemingly out of nowhere, but it does its job -- whereas I might otherwise have skipped that miniseries, now I'm curious to see what happens next. "Man-Bat" and "The Network" round out the book. Joe Harris's "Man-Bat" makes good use of Dr. Phosphorus, last seen in the recent Batman: Detective stories, and also references Man-Bat's wife Francine's ties to the Outsiders, but the story also ends on a cliffhanger which I'm not sure where, if ever, will be followed up. Fabian Nicieza's "The Network" -- as strange a name as "The Underground" -- works as a Birds of Prey story in that Oracle gets the spotlight, though his ultra-violent characterization of the Huntress is largely outdated. There's also a suggestion in the story that former Bird of Prey Misfit is ill, though again it's hard to know if that's something that will be continued elsewhere. 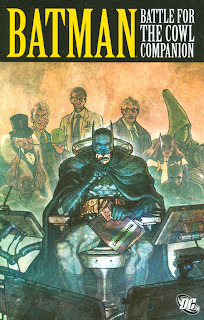 The Battle for the Cowl Companion spotlights a good cross-section of the Batman universe, and each of the stories has a fair or twist at the end; I also appreciated reading a selection of writers I wasn't familiar with. Most of these stories are pretty well disconnected from the main Batman events, however; either they don't branch well from Battle for the Cowl or it's unclear where they're meant to fit elsewhere in the DC Universe. Inasmuch as one might have thought DC would have learned their lesson by now, these seem to be fairly needless crossover issues, banking on rather than adding to Battle for the Cowl. The saving grace indeed is only that they're all surprisingly well written; otherwise this volume might not get the recommendation that it does. This is really a Battle for the Cowl question,not a BftC Companion question,but since this review is newer,I'm posting it here. I'm REALLY not interested in reading Final Crisis,but I'd like to read BftC and Batman and Robin (once that series starts coming out in trades). Do I need to read FC in order to enjoy BftC? I mean,I know Batman -spoiler?- seemingly died at the end of FC,but really is just lost in time. Is that enough? Battle for the Cowl draws more from Batman RIP, so there is no need to worry. I agree that DC needs to have more material that ties into the cross overs rather than banks on them. I wasn't sure what sort of closure the Catwoman story had to the matter and The Network story seemed to bear little connection to the changing forces in the Batman Underground, just Hugo Strange.